I’ve been tracking Labour’s poll rating under Corbyn and comparing it with how the party did in the first few months of previous leaders. In the first entry I said that every leader who started below 40% immediately increased Labour’s vote share by at least 5pts. 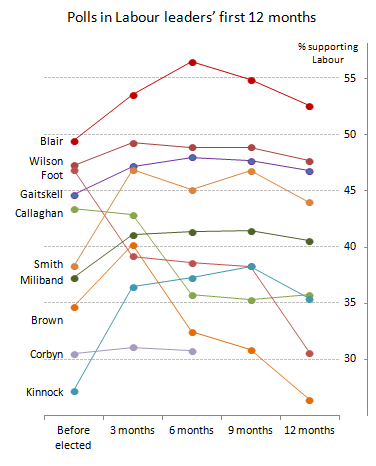 At three months I found that Labour’s score then was the lowest after three months of any modern leader. Note on methodology: As I said last time, the three-month numbers now include the two weeks after 12 December as well as the two weeks before then (to be consistent with the comparisons), so it has increased by 0.8 from the previous version. The six-month number might similarly change when I do the nine-month update. All data is from Mark Pack’s spreadsheet or UK Polling Report. This entry was posted on Friday, March 11th, 2016 at 09:14	and is filed under Labour leadership, Politics. You can follow any responses to this entry through the RSS 2.0 feed. Both comments and pings are currently closed.